As a Fulbright scholar myself, I was honored to be commissioned by the USEFP (United States Educational Foundation in Pakistan) to design the identity, UI/UX and website for Fulbright Alumni in Pakistan. The identity is based on this year’s annual conference- titled “Emerging Leaders”- and visually captures the ideas of young leaders emerging from their states of potential and transitioning into their full potential and positions of leadership, as so many Fulbright alumni have done in the past. 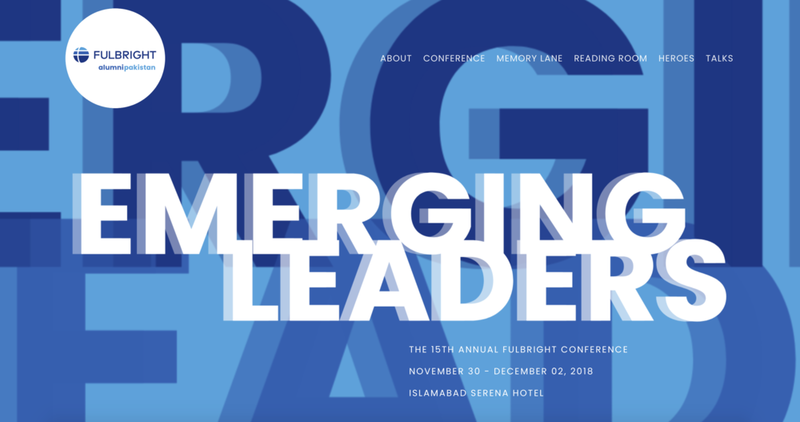 The identity is graphical, and uses typography and transparency to produce a crisp, modern and clean look, in line with the existing Fulbright branding. The website itself has sections for the lauded “Heroes” series, a “Memory Lane” archive that goes through events ranging all the way back to the 1950s and a stories/news section titled “Reading Room”. A new section, titled “Talks”, will be updated with video recordings from the most recent conference in March 2019. The website is hosted on Squarespace via the Sonora template and is fully responsive.